Figure F.1: Octal codes and corresponding symbols for StandardEncoding fonts. The characters and their octal codes in the Standard encoded fonts are shown in Figure F.1, while the characters and their octal codes in the ISOLatin1 encoded fonts are shown in Figure F.2. Dark gray areas signify codes reserved for control characters. In order to use all the extended characters (shown in the light gray boxes) you need to set CHAR_ENCODING to Standard+ or ISOLatin1+ in your .gmtdefaults4 fileF.1. 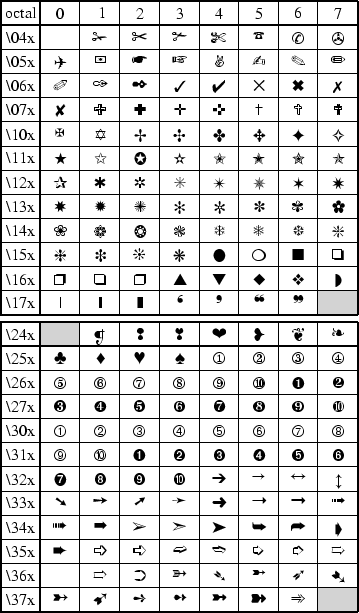 The chart for the Symbol (GMT font number 12) character sets are presented in Figure F.3 below. The octal code is obtained by appending the column value to the ?? value, e.g., is 266 in the Symbol font. The euro currency symbol is 240 in the Symbol font and will print if your printer supports it (older printer's firmware will not know about the euro). Figure F.2: Octal codes and corresponding symbols for ISOLatin1Encoding fonts. 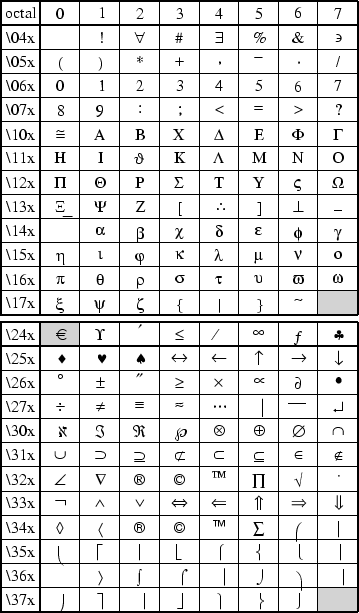 Figure F.3: Octal codes and corresponding symbols for the Symbol font. The Pifont ZapfDingbats is available as GMT font number 34 and can be used for special symbols not listed above. The various symbols are illustrated in Figure F.4. Figure F.4: Octal codes and corresponding symbols for ZapfDingbats font.